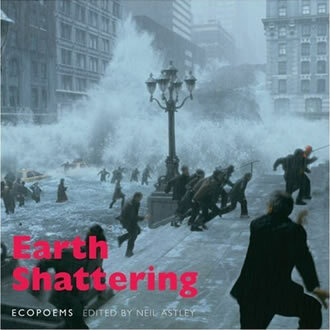 Earth Shattering is the first anthology to include the full spectrum of eco-poetry, from the wilderness poetry of ancient China to 21st-century Native American poetry. It puts Neil Astley, the editor and founder of Bloodaxe Books, right up there with the great anthologists, writes Penny Cole. Neil Astley’s previous anthologies – Staying Alive (real poems for unreal times) and its sequel Being Alive, were a counter-attack against a world humming with empty images. They have become irreplaceable collections of poetry that struggle for, and aspire to, life and true meaning. He has again captured the concerns and spirit of the times, with poems tracking the impact of humans on their world, from the destruction of the buffalo herds to the enclosures of the common land; the pollution of the rivers and seas to the pollution of society with private profit and colonialism; the extinction of species and the creation of poisonous cities where wilderness once stood. And of course the changing, shifting, climate. Eco-poetry is not nature poetry. Rather than admiring and romancing the natural world, it attempts to record and explain the increasingly troubled relationship of human beings with nature. Poets have reflected on this over the centuries with a growing sense of despair. Eco-poetry recognises the great web of life, and human beings’ increasingly alienated relationship to it. Earth Shattering lines up a chorus of over 200 poems addressing environmental destruction and ecological imbalance. But it is a meditation as well as an anthology, bringing together not only poems, but also essays, speeches and thoughts from earliest times, from poets, thinkers, leaders and indigenous peoples through the centuries and up to the present day. From its opening sequence, entitled Rooted in Nature, the book charts an eloquent path from a time when humans were just beginning to commentate on nature as if from the outside, through to today’s poetry of mourning and regret for the results of that alienated relationship. my empty home harbours idleness to spare. City in spring, grass and trees burgeoning. Hating separation, birds alarm the heart. A letter from home worth ten thousand in gold. Soon too few to hold a hairpin up. And hath been once, no more shall ever be. “Take our words. Enrich them. They are already active – but enrich them. …you will forge from our cries a single silver rod. You will put it on display behind a screen. There is an overwhelming sense of the shared guilt of human beings. Wendell Berry speaks of them “dark with power, we remain the invaders of our own land, leaving deserts where forests were”, and Theodore Roethke remembers loosening carpets of green moss when a boy “and afterwards I always felt mean, jogging back over the logging road, as if I had broken the natural order of things…” There is sorrow for lost animals, lost cities, lost trees and poisoned seas. Rainer Maria Rilke mourns the caged life of the panther in the zoo: “It seems to him there are a thousand bars; and behind the bars, no world.” Andrew Motion misses the disappeared house sparrow, that “country clubber, barn bounder, hedgerow flasher, bran dipper, puddle bather, dust bowler, stubble scrounger, dew nibbler creeper sleeper, dung dobbler”. The cries of Blue and Grey Whales are heard along with glimpses of foxes and the Dodo’s funny, lost face. The book is rich with love and longing. The poems are crammed on to the pages, suggesting an overwhelming desire to leave nothing out, to give every creature, landscape and plant its voice, for once. No loss is undescribed, no crime goes unreported. The result is a book that is quite hard to navigate, but has something good on almost every page. But what is missing from the collection – an absence that generates an almost physical ache – is poetry suggesting a way forward. The human, being the source of the problem, cannot offer the solution it seems. Seamus Heaney’s call for “poetry strong enough to help” is interpreted only as warning. The utopian spirit is almost entirely absent. Derek Walcott has said that: “A culture, we all know, is made by its cities.” More than half of humans now live in cities, and so nature today is the city and its hinterland, every bit as much as the rural or the wilderness. The city therefore has to be the key to a poetic imagining of an answer to the problem of the human in the natural landscape. triumph of reason. They know it will happen. They do not love the earth. cling together and tremble with light. Perhaps out there, somewhere, in some country, a new urban poet is imagining a future city as a place of pleasure and calm function; part of a delicate eco-system – rather than the opposite of nature in the shape of “a machine for living”. And this city has to be a real city, the kind people live in from Nairobi to Mexico, Mumbai to Sydney – but poetically transformed into a kind of paradise. This year marks the 30th anniversary of Bloodaxe Book, and this collection is yet another example of its valiant battle on behalf of poetry, with a belief that it can make a difference.